Minis, bites and no wrappers. That's Chief Editor Dave Fusaro's quick, four-word take on the Sweets & Snacks Expo put on May 21-23, 2013 by the National Confectioners Assn. Read about Dave's observations on The Scoop Blog. Facing stagnant growth in their base grocery business, packaged-food companies are increasingly turning to snacks as an avenue for growth, reports Dow Jones Newswire. It's no longer about inventing the next big meal idea, but about coming up with the next big snack for time-impaired consumers, who are looking for healthier and flavorful options. "Nearly 60 percent of snack launches recorded by Innova Market Insights in 2011 had a health positioning of some kind," says Lu Ann Williams, research manager for Innova Market Insights (www.innovadatabase.com), Duiven, The Netherlands. "This is mainly with regard to passive benefits, such as whole-grain, organic, gluten-free or low and light. To a much lesser degree [we see] active benefits, such as vitamin- and mineral-fortification, levels of omega 3 fatty acids or bone health." 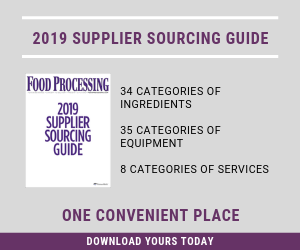 "Snacking is a long-term trend and the future of eating," said Gary Stibel, chief executive of New England Consulting Group (www.necg.net), Westport, Conn., which advises clients such as PepsiCo's Frito-Lay, the largest salty-snack player in the world. "You and I will continue to snack more and sit down to a meal less." It's as if our social-media habits are going right to our stomachs, reports USA Today. In fact, analysts and food companies project enough growth in the $560 billion global snacks market, according to Euromonitor Inc., for most packaged food companies to bite into snacks for a healthier bottom line. Frito-Lay and Kraft Foods Inc. have long enjoyed hearty market shares in snacks. Frito-Lay is adding more premium- and lower-priced chips to its portfolio to capitalize on more growth in those price ranges, while Kraft, will separate its North American grocery business from its more-global snacks division, to pursue growth in emerging markets. After all, snack habits are more similar among countries than are meals. Less expensive than meal options, snacks offer the convenience consumers seek, prices can be raised more quickly and easily than staple pantry products, and since they are often unplanned purchases, buyers are willing to grab them and go to satisfy their immediate snack craving. As American consumers increasing snack more throughout the day, a number of packaged-food companies are dipping into the snack bowl. Kellogg Co.'s pending $2.7 billion acquisition of Procter & Gamble's Pringles brand will vault the cereal maker to No. 2 among salty/savory global snack makers. Also on the acquisition track, General Mills recently added Food Should Taste Good Inc., which makes tortilla chips (with flavors like sweet potato and chocolate) to its portfolio. ConAgra Foods will introduce pre-popped Orville Reddenbacher's popcorn in ready-to-eat bags plus a frozen Greek yogurt in June to be marketed as a healthy snack rather than a dessert. Aside from unique flavor options, snacks are also being developed for consumers looking for healthier options of their favorite munchie. "Consumers are clearly telling us that they are watching what they eat and they want those healthy snack choices or options," says Mark Singleton, vice president of marketing and sales at Rudolph Foods (www.rudolphfoods.com), Lima, Ohio. Pork rinds are low-fat and low-carb. "We are seeing high levels of consumer interest due to the basic nature of the snack – in a world where food brands are one-upping each other with more technology and more benefits, pork rinds are refreshingly simple." Some recent Rudolph Foods introductions follow that "simple" philosophy. The company recently launched Cajun cheese popcorn under its Southern Recipe brand in response to consumer trends focusing on healthier, yet flavorful snacks. "Additionally, we debuted a pork stick with a natural smoky flavor in a few varieties to give consumers another tasty snack to satisfy their hunger," he says. Singleton says perhaps the two top goals are "exploring ways to simplify our ingredient deck and still deliver the most important ingredient -- great taste." "We've been talking to our customers a lot about snacks during the past five years because we've seen consumer behavior change so much," says Kim Holman, director of marketing, at Wixon (www.wixon.com), St. Francis, Wis. "They've redefined what a snack is. People used to think a snack was chips, cookies or crackers. Now snacks are beverages, mini-meals or three items on a tray. "Research shows that a portion of the population has stopped eating three meals a day and gone to five small snacks, which has huge implications for the food and beverage industry," she continues. "Whether you are in foodservice or retail, you have to understand the consumers you are targeting and understand those snacking dayparts. As a marketer, I find it incredibly exciting and there are so many opportunities." Holman thinks really innovative flavor starts in snacks and beverage at retail and moves out to other categories. "A big trend is the onset of gourmet peppers and different kinds of heat being applied to snacks," she says. "It used to be jalapeño; now they've opened it to a variety of peppers – habanero, ancho chili lime – heat with an emphasis toward bold hot flavors. A big megatrend we're seeing is ethnic. In the snack arena, it's easy to translate trends. Within topical applications for snacks, ethnic is a nice playground. We are seeing Korean barbecue, tandoori or curry on salty snacks like chips and popcorn." During March's Snaxpo, a trade show for snack foods, Wixon launched Healthy Tastes for All Ages, a line of products with different flavor profiles for different generations. Targets are baby boomers (ages 48-66), Gen X (ages 32-47), Gen Y (ages 19-31) and Gen Z (ages 8-18). "Each generation enjoys different flavor profiles," she says. "The idea of snacks for everyone is going by the way side. There's a great opportunity to target niche markets and capitalize on flavor trends that resonate with those population groups -- ideas customized to each generation." Holman points out that another trend in snacks is American regional flavors such as Kansas City BBQ or Memphis BBQ. "I wouldn't be surprised if you see in the next year or two a line of American classics, or U.S. flavor profiles," she says. "Chickpeas and legumes have emerged as a big snacking trend, making chips and dip snacks healthier," she says. "People want to try healthier snacks, so sweet potato chips and substrate chips from beans, chickpeas and hummus will move out of the deli section and become more mainstream in the next year or two. When people snack, they realize they can either eat empty calories or instead maximize their health. Yogurt is also being positioned as a dessert or a snack of choice." As for what types of snacks resonate with consumers, Holman says, "Protein bars are very appealing to consumers because of the 'feel full longer' positioning and convenience factor. Beverages as a snack will continue to explode. People are embracing the idea of snacking between breakfast and lunch, and lunch and dinner, and they are looking for beverages. Pumped up juices with proteins and vitamins, that makes you feel good, could be the next big snack. For the snacking generation, biscuits like Nabisco belVita, with whole grains, could be an opportunity as well. It's smart because kids snack a lot, biscuits cross day parts, focus on health and wellness, and you don't have to feel guilty." Who Eats More Snacks, Men Or Women? According to at data on U.S. snacking habits, taken from interviews with more than 5,000 adults 20 years or older as part of the ongoing national "What We Eat in America" survey conducted by the USDA's Agricultural Research Service (ARS), Americans are getting about one-third of all their daily calories from the "empty calories" of snack foods -- that is, from solid fats and added sugar of little nutritional value. Empty calories from snacks account for about 32 percent of the daily calories consumed by women and about 31 percent of the daily calories consumed by men aged 20 and older, whose average intake was 923 calories per day. Men, on average, consume two to three times their limit in the solid fats and added sugars category. For women aged 20 and older, the average intake was 624 calories per day. So women, on average, consume almost two to four times their limit in that category. "Through the utilization of flavors, whole grains, herbs and spices, a manufacturer can create a very tasty snack that is more healthful than an average chip, cracker or candy," says Shane Maack, senior executive chef at Spicetec Flavors & Seasoning (SFS) (www.spicetec.com), Cranbury, N.J., a business of ConAgra Foods Inc. "Flavors can be especially helpful in delivering a profile that might otherwise be impossible to achieve due to the availability or price of a particular ingredient," he notes. "Increasingly, consumers are demanding big, bold flavors in the foods they consume. This is important to remember when developing healthy snacks. In order to meet nutritional guidelines, a manufacturer is forced to reduce sodium, fat and sugar, which often results in a product that is lacking in flavor. Flavors can bridge the gap and help create a product that the consumer feels is both flavorful and healthy." Among those "big, bold flavors," Maack mentions Sriracha, a Thai hot sauce made of red chilis. Healthy reformulating often means switching oils, since many snacks, especially traditional chips, are fried. At the recent Natural Products Expo West – a pantheon dedicated to healthy snacking -- Viterra Inc. and Dow AgroSciences jointly announced verraUltra9, a natural omega-9 canola oil. It's rapeseed source is Non-GMO Project verified and it's expeller-pressed. "Viterra supplies canola oil with a healthier fatty acid profile compared to other vegetable oils (7 percent saturated fat compared to soybean oil at 15 percent or palm oil at 51 percent)," says Bryan Allison, general manager of canola processing at the Regina, Saskatchewan-based company (www.viterra.com/canolaoil). Plus, the unique fatty acid profile of verraUltra9 provides desired health benefits in food applications that require higher stability. "Viterra's processing plant in Manitoba uses a double expeller-pressed process, which has a positive connotation in the natural foods segment," Allison explains. "The natural snacks segment of the market is growing at rates greater than the overall food and beverage market," he says, although even large, mainstream food processors are taking note. "We have seen steady momentum building for our expeller-pressed non-GMO canola oil, which allows food manufacturers to develop products with cleaner labels." Is it Possible to Make Healthier Foods Kids Will Eat?